Not So Humble Pie, creator of yummy cookie lab rats, chocolate atoms and gingerbread scientists (to name a few), brings us a delectable contribution to the world of cake decorating: the candied bacon cake. 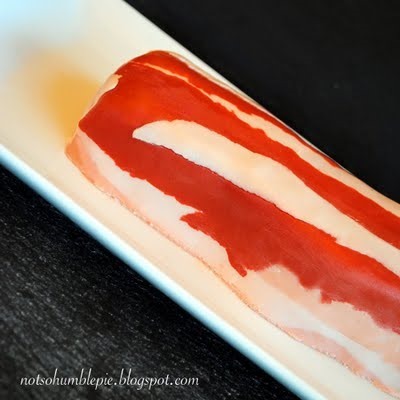 This cake looks like bacon, and actually tastes a little bit like bacon, too. "Everything tastes better with bacon, so why not cake? ...Right? 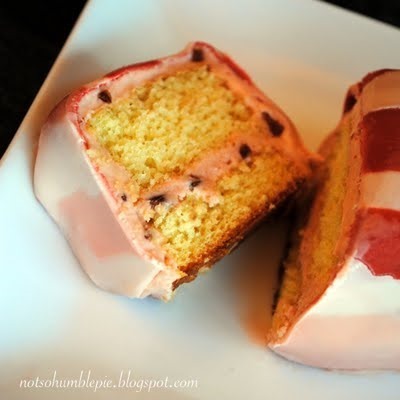 It seemed wrong to make a bacon cake and not actually include bacon IN the cake. To do so would make the cake a total lie. So I decided to whip up a batch of candied bacon and crumble that into some maple butter cream frosting." Click through to learn how it was made, if you're interested in trying-it-yourself (P.S. fondant used - brush up on your skills here). Who's Behind This Obsessively Realistic Baby Cake?